Executive chef Saul Canesa and visiting Texas native chef and Tex-Mex connoisseur Ben Berryhill make everything from scratch at Pacifico Cantina. 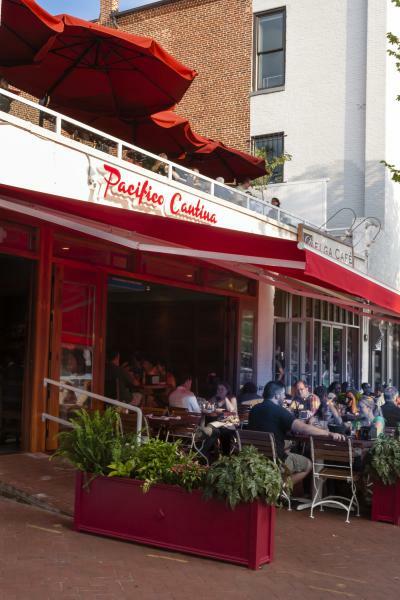 The newest restaurant from Xavier Cervera (Molly Malone’s, Senart’s, Boxcar Tavern), along the ever-growing Barracks Row area, Pacifico Cantina has been most popular with the Happy Hour crowd for its large open-air roof deck. Lunch and dinner offer a pretty standard assortment of Tex-Mex starters and entrées, including nachos, quesadillas, fajitas and burritos. Closest Metro is Eastern Market. The interior of the expansive dining room is washed with bright teals, oranges, and yellows – contrasting the hardwood furniture and bar. It was already very crowded when we arrived and we chose to settle in a seat outside under awnings at street level. 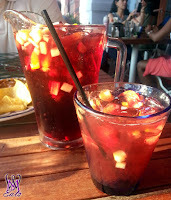 We ordered a pitcher of the Sangria Roja and our server accidentally brought us a half-pitcher, but realized his mistake and brought over a second half-pitcher right away. Studded with mostly diced apple pieces, the sangria was slightly watered down but was refreshing. We probably would have been satisfied with just the half-pitcher, but the full pitcher may be more appealing for those wanting a bit more alcohol kick. Since it was unseasonable hot this day, I wanted something light to eat and chose the chicken flautas, their housemade taquitos, from the appetizer section. Three deep fried pieces came topped with avocado slices and cream with a spicy dipping sauce on the side. 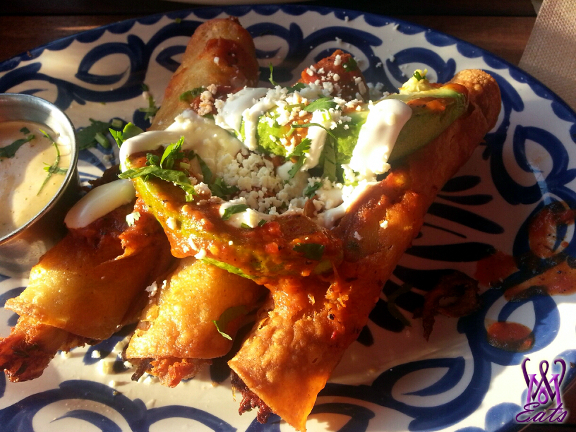 The flautas were slightly overcooked, especially on the ends, and very greasy but the insides were creamy and had decent flavor. 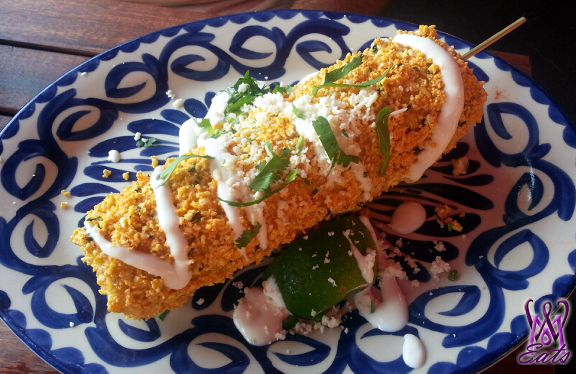 Keith ordered the Mexican Street Corn to start. It looked very pretty on the blue and white designed plate, but was incredibly messy to eat. Not appropriate date food. The flavor was alright, salty from the cheese, and tart from the lime juice. 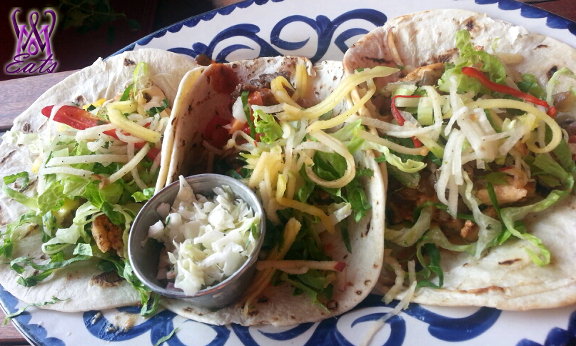 For his main dish, he chose three tacos: Baja Fish (fried fish), Carne Asada (marinated skirt steak), and Grilled Chicken. He found them all a bit plain and small, and did not like that they were served in a flour tortilla, rather than more traditional corn tortilla. Coupled with the soggy gratis chips and odd tomato salsa, I was underwhelmed with my first visit and not very satisfied with my meal. I would come back to give Pacifico Cantina another chance and order something more substantial. Keith stated he would only comeback for drinks, but prefers Banana Cafe for Mexican food along Barracks Row.